Pool Slide & Custom made Waterslide | Industry Resources | Dolphin Waterslides, Inc.
Dolphin WaterSlides is now an official waterslide vendor for Pool Studio! Pool Studio users can find and insert scaled 3D renderings of the various slides we offer, including one piece slides and custom designs. Be sure to check out this awesome program for builder and designs in the pool and landscaping industry. RicoRock® Inc. is the industry leader for pool rock and waterfalls in the U.S. Dolphin works directly with several builders and designers that use RicoRock for all their water fall and pool features. Luxury Pools is one of the leading industry magazines dedicated to what other than Luxury Pools and products to consider when planning your pool. 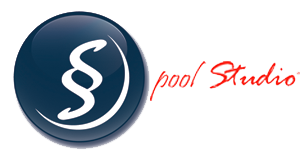 San Juan Pools are known for their high quality in ground fiberglass swimming pools. Check out The Aqua Mall where you can purchase a vast variety of pool products and accessories for your pool or the pool you are building for a client!